If you're planning a family vacation or romantic getaway, you're probably aware of the huge number of ways to search for the right flights and hotels. And while all of these search services work hard to show you the lowest prices, a lot of them miss the mark where it comes to helping you find the best trip. For example, would you pay $10 more for a flight without a lengthy layover (or without a layover at all)? Even penny-pinchers might find spending that much money to be a worthwhile investment. And what about extra legroom, Wi-Fi access or the best hotel pool? We might consider these must-haves for a happy vacation, but budget-minded search sites can make these amenities harder to hunt down in an effort to save you a buck or two. A new crop of travel sites is focusing less on cost and more on happiness to help you find not the lowest price tag without impacting your enjoyment on your trip. We'll walk you through the most helpful sites to help book your perfect vacation. 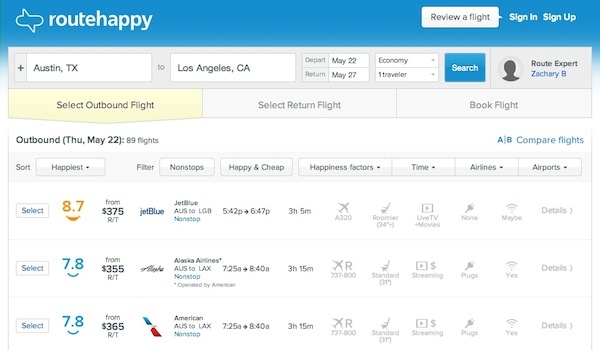 We're big fans of Routehappy, which literally ranks flights based on, yes, happiness. Routehappy tries to find the right balance between a pleasant flying experience and the lowest price. The search is simple: Enter your starting point, your destination and your travel dates, and Routehappy sets out to find the happiest flights. Sort options by happiest, cheapest, fastest or departure or arrival times, and filter for nonstop, happy and cheap options, nicer planes, roomier seats, high ratings, Wi-Fi, entertainment options and at-seat power in addition to standard options for time and airline. Though it doesn't show information on extra fees on the search page, clicking on any flight on Routehappy provides extra info about bag fees; it would be nice if this were shown on the main page for more accurate cost calculations, but it's not a deal-breaker. The downside to Routehappy is that it doesn't offer a lot of flight flexibility. You can't book multi-leg trips or use flexible dates. For that, we like Hipmunk, which offers similar search features with even more options. Search Hipmunk for one-way, round-trip or multi-city flights by entering your starting point, destination and travel dates. Then Hipmunk brings up a list of flights sorted by the lowest "agony" level, which is a combination of price, duration and number of stops. 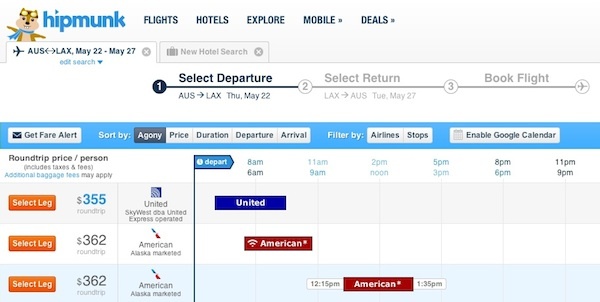 Though Hipmunk doesn't offer the amenity details Routehappy focuses on, it definitely helps find the flight options that are least likely to start your vacation off with frustration. Hipmunk lets you sort results by agony, price, duration and departure or arrival times, as well as filter by airlines, number of stops and nonstops. To put these sites through their paces, we went shopping for a trip from Austin, Texas, to Los Angeles, California, at the end of May. Routehappy suggested a nonstop JetBlue flight with a happiness rating of 8.7 for $375 round trip with a free checked bag. The next flight, with Alaska Airlines, rated 7.8 on happiness but only cost $355 for a round-trip, nonstop flight — but with fees for checked baggage, it could be just as pricey as JetBlue for a less happy flight unless you're going with a carry-on bag only. Hipmunk guided us towards cheaper flights, suggesting a nonstop flight from United for $355 round trip. However, we found little information on the flight's amenities — just an icon showing whether or not the flight had Wi-Fi — and the only warning about baggage fees comes before you pay, when an "additional baggage fees may apply" warning pops up. Still, with baggage fees to be expected on most airlines, we don't think this is a deal-breaker either, especially when Hipmunk does such a good job of directing you to low-pain flights. With so many hotel options available, finding the perfect place to stay can be even more of a hassle than choosing the right flight. For general hotel searches, we turn to Hipmunk again. Much as it does with flights, Hipmunk rates hotels on their "ecstasy" level, which is a combination of price, rating and location. Enter a location and your check-in and check-out dates, and Hipmunk offers an array of hotels with photos, ratings and TripAdvisor ratings (when available). You can sort by ecstasy, price, stars and reviews as well as filtering by business, kid-friendly, luxury or romantic getaway.You can also narrow your search by property type, amenities and specific chains you might be interested in staying in. Hipmunk is unusual amongst hotel search engines in that it includes Airbnb's unique properties as results in your search. If a conventional hotel stay isn't what you want, though, you'll probably want to visit Airbnb directly. Airbnb offers unique rentals ranging from single rooms to entire houses to truly unique experiences like a stay in a treehouse or a train caboose. Enter your location and trip dates, and you'll get a range of options with photos and reviews. Sorting options are limited to location, price, property type (private room, shared room, etc.) and a few basic amenities, but that's still more than enough to find some truly individual vacation experiences. If you want the most search options possible, you'll want to try Hotels.com. Though it's a pretty conventional travel search engine, it offers the most options to filter your results to find the exact property you want. In addition to standard filters for price, location, property type, amenities, and ratings, Hotels.com also lets you easily narrow your options by distance to specific attractions or landmarks, by accessibility features for disadvantaged travelers, and by more themes than other searches offer including beach, boutique, business, casino, family-friendly, golf, historic, LGBT-welcoming, luxury, romantic, shopping and spa trips. On the downside, because it's such a general search, it probably won't hit the perfect hotel until you configure all of the filters. We gave all three of these searches a test run looking for a hotel for our imagined Los Angeles trip. Without any filtering, Hipmunk suggested a $119-a-night stay at the Millennium Biltmore Hotel, which ranks three stars or three and a half stars on TripAdvisor, followed by a loft listing from Airbnb and then by more reasonably priced and reasonably rated — but not necessarily stand-out — hotels. Airbnb immediately impressed, with the first result featuring splashing photos of a waterfront suite in Marina del Rey for $130 a night. Other options included a historic home in Venice, a guest house in Manhattan Beach, and a kitschy, 60s-style trailer just blocks from the beach. Hotels.com's listings were by far the most conventional, suggesting big brands like Marriott (a top-of-the-page sponsored listing for $1,295 a night) and Loews Hollywood (for $229 a night). However, it just takes a few seconds to apply filters to get highly rated hotels more in our price range, like the Millennium Biltmore that Hipmunk recommended. Whatever your travel situation, you can't go wrong with one of these travel searches. All of these will help you narrow your vacation searches to find ideal flights and hotels that will transport you to vacation bliss.